(a) The Ex-Sailor was not and could not be drafted to Fleet Reserve Service because of the discontinuation of the Policy. 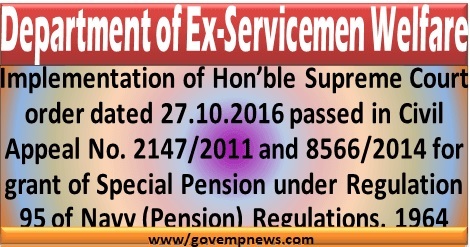 (b) The Ex-Sailor did not exercise the option to take discharge on expiry of engagement period i.e. the Sailor opted for retention in active service, but not granted extension to qualify for pensionable service. 2. Arrears to be paid w.e.f. three years preceding the date of filing of application by respective Ex-Sailors, along with interest on the arrears @ 9% pa. as per the Court order under reference. 3. - The amount of Gratuity and DCRG paid be adjusted against the amount payable. Necessary PPO may be issued immediately. 5. This issues with the concurrence of MoD(Finance) vide their iD No.17(06)/2017/Fin/Pen dated 8th Sept 2017.